You hire an Eric Cantor. What do you expect him to get up to? “But Wall Street always goes with the sure bet and the well-worn path. They’re paying him a guaranteed — you’ve got to love Wall Street, you guarantee money because you can’t fail on Wall Street — they’re guaranteeing him $3.8 million. You don’t guarantee someone $3.8 million because you’re training him to be an investment banker. “Wall Street is after what it’s always buying in Washington: access, influence, and unfair advantage. And Cantor is a big catch for anybody who wants access. Look, if you’re in congressional leadership for X number of years, you know plenty that’s worth a lot of money. If you’re the majority leader, who’s in charge of the agenda and vote counting? One of your jobs is to make sure you’re doling out favors to people. There are dozens and dozens of House members indebted to Eric Cantor for the things he’s done for them. You’re worth a lot. What does that look like? What are the issues — the legislative and regulatory fronts — that Wall Street is currently trying to shape? “The list of issues that Wall Street has in Washington is long, deep, and broad. “They’re going to be fighting everything from tax policy on carried interest, to derivatives, to capital rules, to making sure the [Commodity Futures Trading Commission] is never properly funded, to making sure that the biggest deregulation bill since the repeal of Glass-Steagall, the mislabeled ‘Jobs Act,’ is put in place. “He was consistently referred to as Wall Street’s go-to guy. 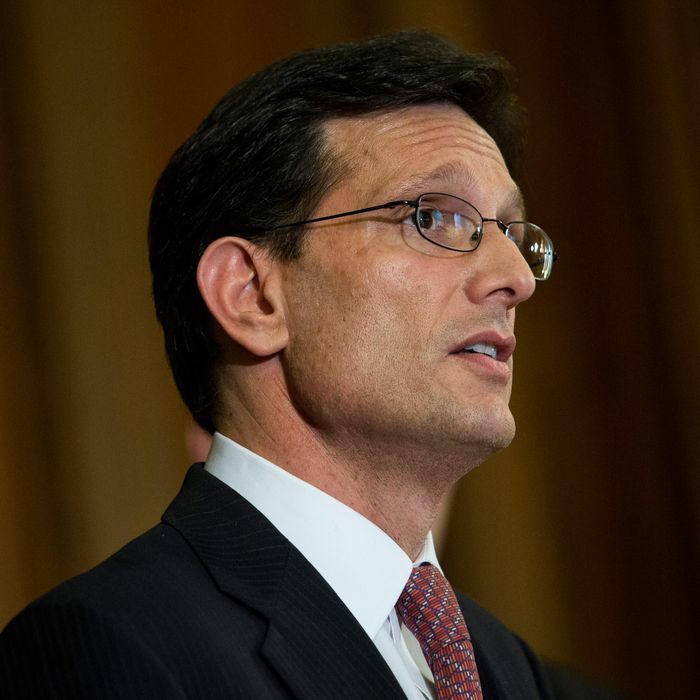 There were few people more important both to Wall Street and to Congress as Eric Cantor. He was the number two in the House! “It’s not only about working in the shadows to get Wall Street’s business done in the policy arena. It’s directing Wall Street cash to the right Wall Street–friendly politicians. It’s making sure you’re getting those Wall Street–friendly politicians on the right committees. It’s getting to them early and often. He’s done all that. So, why go to a small firm rather than a Goldman Sachs or a Citi? “It seems to me that there are two things going on there. “The so-called smaller firms — however you want to refer to them — most of their issues overlap with the big Wall Street firms: carried interest; derivatives; making sure the Wall Street cops aren’t funded, whether the CFTC or the [Securities and Exchange Commission]; deregulation; and non-regulation to the furthest extent possible. But there’s an additional incentive that the second- and third-tier firms have. That is buying entrée to the next level. One of the ways to do that is to hire a Tim Geithner or an Eric Cantor. What do we know about the effect that these former politicians have on the political process? “The revolving door is really important. It’s not just because of public officials selling out and influence-peddling. It’s even more important because it has this corrosive effect on confidence in government and public officials. The American people basically see Wall Street and Washington as in cahoots. They see massive bailouts funneled to Wall Street. They see no accountability. They see no prosecutions. And they see high-level officials coming from Washington, going to Wall Street, and getting paid. Is there a good way to quantify the effect on the legislative process? “There really isn’t. The clearest example is the total lack of funding for Wall Street’s cops, the SEC and the CFTC. You’re using funding to prevent Wall Street from being policed. “Then there’s the constant attack on the regulators. Not only are they filing bills in the House that don’t go anywhere, they’re holding hearings, they’re dragging regulators up there. Take Mary Schapiro. She was there for four years, and she testified more than once a month! I think she appeared more than 40 times. That’s a level of harassment that is just beyond the pale. You’ve got to prepare. You’ve got to go up there. They buttonhole you before and after. They make phone calls. They write letters. It’s not just the SEC and the CFTC, either. It’s all the regulators, at the [Federal Reserve] and the Treasury and elsewhere.